International migration has been described as one of the defining issues of the twenty-first century. While a lot is known about the complex nature of migratory flows, surprisingly little attention has been given to one of the most prominent responses by governments to human mobility: the practice of immigration detention. 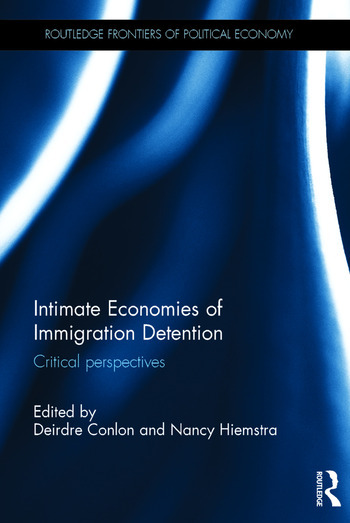 Intimate Economies of Immigration Detention provides a timely intervention, offering much needed scrutiny of the ideologies, policies and practices that enable the troubling, unparalleled and seemingly unbridled growth of immigration detention around the world. An international collection of scholars provide crucial new insights into immigration detention recounting at close range how detention’s effects ricochet from personal and everyday experiences to broader political-economic, social and cultural spheres. Contributors draw on original research in the US, Australia, Europe, and beyond to scrutinise the increasingly tangled relations associated with detention operation and migration management. With new theoretical and empirical perspectives on detention, the chapters collectively present a toolbox for better understanding the forces behind and broader implications of the seemingly uncontested rise of immigration detention. This book is of great interest to those who study political economy, economic geography and immigration policy, as well as policy makers interested in immigration. Deirdre Conlon is a Lecturer in Critical Human Geography at the University of Leeds, UK. Her research examines immigration enforcement and detention in policy and practice, their effects on migrant (in)security, citizenship and everyday life, as well as the wider reverberations of immigration control. Nancy Hiemstra is Assistant Professor of Migration Studies at Stony Brook University in New York, USA. Her research analyses the geopolitical and socio-cultural reverberations of restrictive immigration policies and practices in the United States and Latin America, with a focus on US detention and deportation.